Continuing our exploration of Live Nation and social media, this past weekend I noticed that Live Nation asked concert fans a very interesting question on their Facebook page. And I’d like to ask you the same one too, but in a different way. Now, I invite you to take a moment to share your ultimate scenario and post it in the comments below. 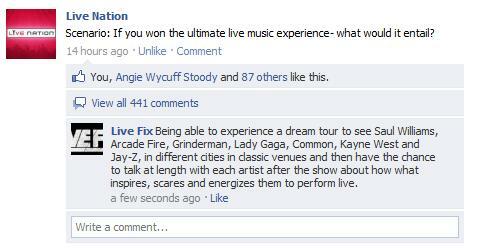 As I was posting my response on their Facebook page, I asked myself… Is Live Nation’s Facebook community truly a community of live music fans, and do fans feel like their concert moments are truly being celebrated or just turned into marketing research and service promotion like their Ticketology blog. And if social media is suppose to allow companies and brands to be transparent, than why doesn’t Live Nation lead the way and find a creative way to use their Facebook page to tell the ongoing story of the merger and the current state of the concert ticket industry as it continues to dramatically impact the fan experience. And is Live Nation really interested in celebrating the fan experience? Or should we continue to assemble our Concert Fan Complaints Choir? And stay tuned as we share more of our extended SXSW 2011 coverage and quotes from the concert ticketing industry panel we attended while in Austin. Concert News: Lupe’s Chicago Fiasco, Britney’s Not Wanted, Jackie Chan Helps Japan, E-40 Fan Goes To Jail..